Alert, gentle mannered, playful and affectionate. A cheerful attitude is the hallmark of the breed and one should settle for nothing less. The colour is white. There may be shadings of buff, cream or apricot around the ears or on the body. The undercoat is soft and dense, the outer coat of a coarser and curlier texture. Their size ranges from 9.5 inches (24 cm) to 11.5 inches (29 cm). These clean, low allergy dogs need regular grooming, particularly around the face, feet and ears. Playful when young, they often become couch potatoes as they age. They bond closely with their owners, but are shy with strangers. 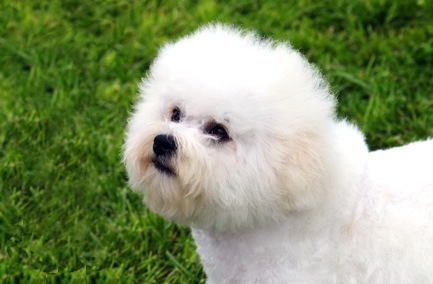 They have a high incidence of bladder stones so diet is very important in Bichons.